A new law expected to pass in Bolivia mandates a fundamental ecological reorientation of the nation’s economy and society. Indigenous and campesino (small-scale farmer) movements in the Andean nation of Bolivia are on the verge of pushing through one of the most radical environmental bills in global history. The "Mother Earth" law under debate in Bolivia's legislature will almost certainly be approved, as it has already been agreed to by the majority governing party, Movimiento Al Socialismo (MAS). The law would give nature legal rights, specifically the rights to life and regeneration, biodiversity, water, clean air, balance, and restoration. Bolivia's law mandates a fundamental ecological reorientation of Bolivia's economy and society, requiring all existing and future laws to adapt to the Mother Earth law and accept the ecological limits set by nature. It calls for public policy to be guided by Sumaj Kawsay (an indigenous concept meaning “living well,” or living in harmony with nature and people), rather than the current focus on producing more goods and stimulating consumption. The law will be backed up by a new Ministry of Mother Earth, an inter-Ministry Advisory Council, and an Ombudsman. Undarico Pinto, leader of the 3.5 million-strong campesino movement CSUTCB, which helped draft the law, believes this legislation represents a turning point in Bolivian law: "Existing laws are not strong enough. This will make industry more transparent. It will allow people to regulate industry at national, regional, and local levels." 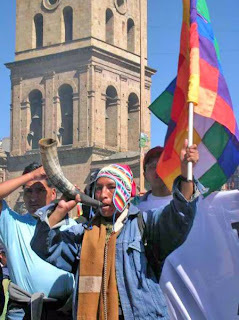 However, there is also strong awareness among Bolivia's social movements—in particular for the Pacto de Unidad (Unity Pact), a coalition of the country's five largest social movements and a key force behind the law—that the existence of a new law will not be enough to prompt real change in environmental practices. A major obstacle is the fact that Bolivia is structurally dependent on extractive industries. Since the discovery of silver by the Spanish in the 16th Century, Bolivia's history has been tied to ruthless exploitation of its people and its environment in order to transfer wealth to the richest countries; poet and historian Eduardo Galeano’s famous book Open Veins draws largely on the brutal story of how Bolivia's exploitation fuelled the industrial expansion of Europe. In 2010, 70 percent of Bolivia's exports were still in the form of minerals, gas, and oil. This structural dependence will be very difficult to unravel. In 2010, 70 percent of Bolivia's exports were still in the form of minerals, gas, and oil. This structural dependence will be very difficult to unravel. Moreover, there is a great deal of opposition from powerful sectors, particularly mining and agro-industrial enterprises, to any ecological laws that would threaten profits. The main organization of soya producers, which claimed that the law “will make the productive sector inviable,” is one of many powerful groups who have already come out against the law. Within the government, there are many ministries and officials that would also like the law to remain nothing more than a visionary but ultimately meaningless statement. Raul Prada, one of the advisors to Pacto de Unidad, explained that the Mother Earth law was developed by Bolivia's largest social movements in response to their perceived exclusion from policy-making by the MAS government, led by indigenous President Evo Morales. They have generally supported MAS since its resounding election victory in 2005, but were frustrated by what they saw as a lack of progress. Rather than merely expressing their concern, these movements—comprised mainly of indigenous and farming communities—are pro-actively developing a series of new laws. Their first priority was the passage of the Mother Earth Law, based on a commitment made at the historic global Peoples Conference on Climate Change held in Bolivia in April 2010. To some surprise, the diverse movements soon developed a consensual agreement that was supported by MAS legislators. inspirationsal. god bless this movement. Blessings to the Bolivians and I hope this law is adopted in the whole world! Yes, Yes, Yes, Hooray for Bolivia! Hooray for the indigenous! Congrats to mankind! What a Concept to see Mother Earth as a Being with rights. Very good place to start cleaning up this mess! Could be i have found that place on this earth to be until that time when time is no more for me. Is immigrant status difficult to obtain?